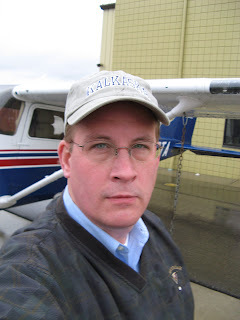 Many of you know that I’m a pilot and aviation enthusiast. But I’m also, among other things, a Certified Management Accountant and Certified in Financial Management. When I prepared for those professional exams, I used Gleim knowledge transfer materials. Imagine the pleasant surprise when I started flight training and found out that Gleim knowledge transfer materials were available for the FAA exams as well. I expected the same concise treatment of the issues and questions that helped me to understand the materials well enough to approach the test with confidence. And that’s exactly what I got. I’ve used the Gleim study software and print publications for both the private pilot knowledge test and, more recently, the instrument knowledge test. And this time I added the Gleim audio preparation CDs for the instrument knowledge test. Needless to say, I passed both the first time with flying colors. I’m on to my next challenges now, which include getting my ground instructor and instrument ground instructor certificates. And how do you think I’m preparing? You guessed it. With Gleim knowledge transfer systems. Gleim is providing my study materials for the FAA tests for those certificates and other consideration and, in return, I’m making these mentions on Airspeed. As you might guess, it was an easy deal for me to do because I’ve prepared for – and passed – four tough certification exams with Gleim materials and I wouldn’t think of going after these new certificates without Gleim knowledge transfer materials. I’ve tried all of the major brands of flight training materials and I think the world of Gleim knowledge transfer systems. And, for a limited time, by special arrangement with Airspeed, Gleim will give Airspeed listeners 25% off their purchases of Gleim knowledge transfer materials. That’s right. Just give the promotional code “ASPD” at the time of your order and Gleim will knock 25% off any Pilot Kit you order just for being an Airspeed listener. Gleim has knowledge transfer systems for Sport Pilot, Private Pilot, Instrument Pilot, Commercial Pilot, Flight/Ground Instructor, Airline Transport Pilot, Multi-Engine, and Flight Engineer and even specialty materials like refresher courses great for use before your BFR or Instrument Proficiency Check. No matter how you learn best, Gleim packages the information in a way that’s right for you. From online courses like Gleim’s Online Ground School to test-prep CD-ROMs to books and audio programs, Gleim has a system that’s right for your learning style. You can reach Gleim at http://www.gleim.com/ or call them up on the phone at (800) 874-5346 and remember to use the promotional code “ASPD” to get your 25% Airspeed listener discount for a limited time only. The Gleim logo is a trademark of Gleim Publications, Inc. and/or Gleim Internet, Inc. Airspeed makes no claim to such trademark. Gleim and Airspeed are independent contracting parties and are not partners or affiliates. 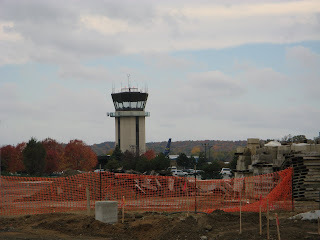 Checkride Update for 25 October – IFR Checkride Complete! Subscribe to Airspeed through iTunes or your favorite other podcatcher, listen to audio at http://airspeed.libsyn.com/, or download directly at http://media.libsyn.com/media/airspeed/AirspeedCheckrideUpdate2007-10-25.mp3. I passed the checkride this morning! Thanks for the cards and letters. 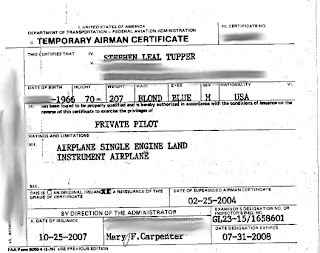 They meant (and continue to mean) a lot.I received approval from the examiner to include audio from the checkride in a future episode, so you can expect to hear the highlights sometime soon. In the meantime, it’s back to Airspeed as usual. Upcoming episodes include an interview with Castrol aerobatic and racing pilot Mike Goulian, flying skydivers in the Super Otter with Dave Schwartz of Skydive Radio, and lots more. Thanks for hanging in there with me. If you were beginning to be annoyed at the constant Checkride Updates, all I can say is “You and me both!” I never thought it would take four tries to get flyable weather, but that’s my beloved State of Michigan in October for you. It has its upsides. I arrived at the checkride with more than 15 hours of actual, which is off-scale high for an instrument candidate, and I have the local weather and some excellent flight instructors to thank for that. And I think that it made me a better IFR pilot. But it gets a little tedious doing the flight planning each time and having to keep the knowledge for the oral current and ready for recall. Back to our regularly-scheduled podcast. And some great adventures ahead! Subscribe to Airspeed through iTunes or your favorite other podcatcher, listen to audio at http://airspeed.libsyn.com/, or download directly at http://media.libsyn.com/media/airspeed/AirspeedCheckrideUpdate2007-10-23.mp3. Got 1.9 this morning, including 0.8 actual, and shot the VOR full procedure 18 at KFNT, the ILS 27 at KFNT, and the RNAV 18 at KFNT before heading back and shooting the ILR 9R at KPTK. This was a warm-up flight to prepare for the checkride this afternoon. I flew well other than getting a little far off to the right on the RNAV 18 and having the GPS conk out just short of HEBUB (thereby depriving me of the ability to descend below 1,560 or so). Here’s a pretty indicative picture of circumstances. Nice generally, but scattered between 800 and 2,500 with broken or overcast layers between 1,800 and 6,500. Not enough to go and do the flight portion of the checkride. 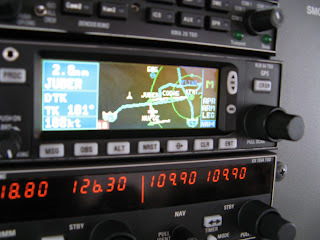 The radio stack showing the first leg of the RNAV 18 heading for JUBER. Anyway, I got through the oral in fine form. The studying paid off and I either answered decisively or could just look the examiner in the eye and tell her that I didn’t know the answer. Only missed two questions and I’ll have that information together when I return on Thurssday. The ceilings and scattered layer made the flight portion impracticable, so I’ve rescheduled for Thursday. I therefore have a nice new Letter of Discontinuance from the examiner. The letter basically declares what I’ve completed and says that I can pick up where I left off between now and December 22. Ready to go for Thursday, but I stopped at DCT Aviation and got my card loaded up with another two hours. The plan is to show up on Thursday morning around 7:00 at Tradewinds and preflight the aircraft. Then I head for DCT around the corner when Pontiac Air Center opens at 8:00 and fly sim for an hour before coming back to Tradewinds to meet the examiner at 9:30. Then it’s time to fly the ride. Light touch on the yoke and trim, trim, trim! Needle in the donut, baby! Nothing wrong with a little IFR practice out on the course. 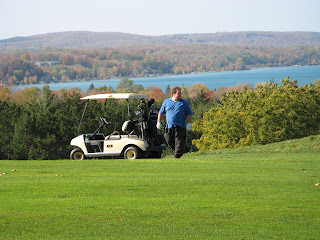 We did the annual WallyFest this weekend up near Traverse City , including a round Sunday at Pinecroft. 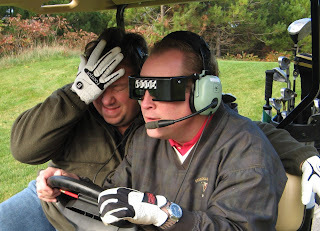 My safety pilot here is fabled chef and best friend Jim Kreucher. 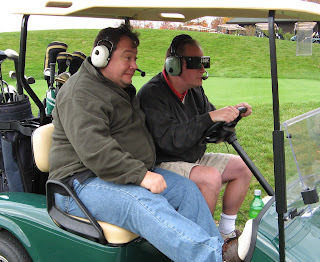 He’s not worried about my flying (although there are precious few instruments on a golf cart). He wanted the David Clark headset. But he understands that my hood is attached to my headset and allowed as how simply driving with my eyes closed would be disadvantageous. 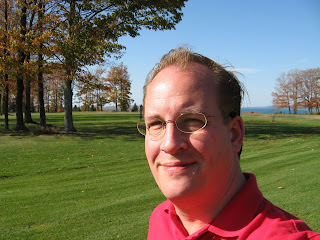 A shot from the fairway at Pinecroft. Beautiful view of the water. Skies pretty clean and winds that must have been gusting to 30 knots or so at times. Actually had to take the wind into account when putting. Saw only one GA aircraft the whole day. Another shot of Kreuch on the fairway. I think that the colors were just a little past peak, but there were some gorgeous scenes when the sun hit some of the oranges and yellows. 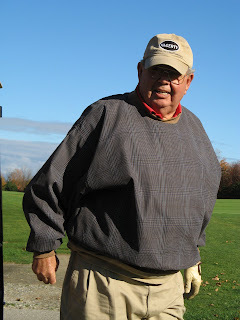 The namesake of WallyFest, Wally Tupper – My dad. 70-plus and still a danger on the course. I’m happy to say that I took home (or rather kept possession of) Der Tupper Hackenfest traveling trophy (even though I’ve been a pig for the last year and have failed to turn it over to the winner because I’ve forgotten to bring it along). We usually play on Jekyll Island, Georgia as close to the Ides of March as possible and then up north around Traverse City, Michigan around September 15, although we’ve pushed it into October this year and last and lucked out with the weather. The fall iteration is WallyFest proper and the spring is whatever we happen to call it at the time. Checkride prep? Studying the cards and flying a little sim and that’s it. It has been about a month since I’ve flown an actual aircraft and I’m a little bothered by that. A fair amount of sim, but I really need to get into the aircraft before the checkride. 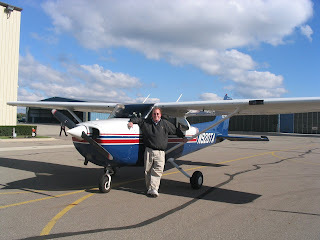 I’m scheduled to take up N20TA with Steve Roemer from 10:00 to 12:00 tomorrow and the checkride is scheduled for 1:30. Temperature/dewpoint is supposed to be 10/7 and the sky is supposed to be partly cloudy, but that gives us 4,000 feet until freezing and we should be able to go up IFR if needed. The afternoon is supposed to dry up (14/3) and it’s looking pretty decent for the ride. Winds WNW to W at 10-14, which should be good. Van Halen tonight at the Palace, which bodes ill for rest, but I’m getting home just as quickly as I can after the show and will probably sleep at least until 8:00, which ought to give me a good seven hours. No real way to avoid the show and I don’t really want to miss it. Going with a good friend from my prior banking days and taking along the co-leader of the firm’s IT practice. Should be a good time as long as I can avoid the snarl of traffic getting out of the Palace. Checkride Update for 19 October – No Dice! Winds aloft at 3,000 forecast 230 at 40. Surface winds at 18 gusting to 35. And ceilings are supposed to be 2,500 overcast with occasional light rain. It’s gorgeous here at the moment, but it’s supposed to deteriorate later. Not going to happen today. Rescheduled for next Tuesday, 23 October (the day after the Van Halen show at the Palace – Egad! ).